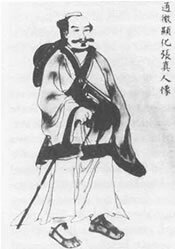 Chang San-Feng is credited with developing the Chinese internal system known as Tai Chi Chuan. He was born in 1247 A.D. There are many stories of exactly Tai Chi Chuan was developed by Chang San-Feng and no one today knows the accurate story. Some of the accepted facts, however, are that he was a very intelligent man, he studied Shao-Lin Chuan for about ten years and mastered it, and with the foundation in Shao-Lin Chuan he developed the original thirteen postures of Tai Chi Chuan. For many centuries, the secrets of Tai Chi Chuan were passed down to a selected few students, who then passed the secrets down to their students. Only in the last few hundred years did Tai Chi Chuan become available to many people in China and not just a select group. Only recently did Tai Chi Chuan become available to the West. Great Grandmaster Cheng Man-Ching was one of the unique individuals that made Tai Chi Chuan available to Western students. keeping the entire body light and nimble. directed by the waist, and expressed in the hands and fingers. superior position and create a good opportunity. disorder, adjust the waist and legs. Mind-Intent and are not to be expressed externally. Withdrawing. If there is left, there must be right. If the initial intent is upward, you must first have a downward intent. the intent of pushing downward. Then the root will be severed, and it will be immediately and certainly toppled. entirety, all things have this nature. If you didn't notice, the picture on the home page is that of Chang San-Feng, the original founder of Tai Chi Chuan.